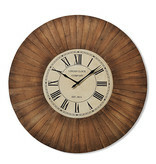 Home / Antique Wood Hanging Wall Clock 30.75"
Delivery time: This item is only available for In-Store Pickup and may be a Special Order. We have finish samples available in store and can assist you in placing your order over the phone, via email or in store. Please contact us for more details.